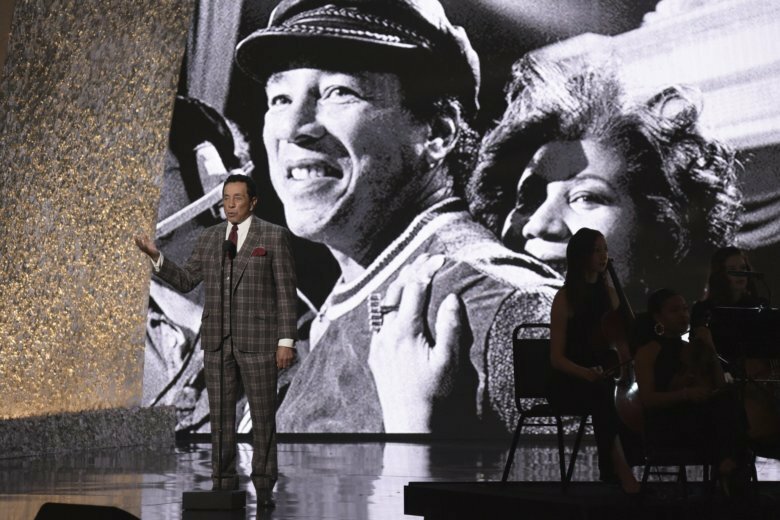 LOS ANGELES (AP) — For Smokey Robinson, the late Aretha Franklin was more than just the Queen of Soul. Robinson told a packed venue that Franklin was his longtime neighbor in Detroit, calling the acclaimed singer his “little sister” whom he still misses at the “Aretha! A Grammy Celebration for The Queen of Soul.” He along with some of music’s well-respected artists such as Alicia Keys, Celine Dion and Patti LaBelle took the stage to help bring Franklin’s favorite songs back to life during the Jan. 13 taped tribute concert in Los Angeles. The tribute will air March 10 on CBS. “She was the girl next door. In fact, she was the girl right around the corner who became a lifelong friend, who became a musical icon,” said Robinson of Franklin, who last year died at age 76 from pancreatic cancer at her home in Detroit. When they were younger, he said they played hide-and-seek and kick-the-can games outside. “Before Aretha passed away, she was my longest living neighborhood friend,” he said. Franklin certainly left her imprint on music and the world. She had dozens of hits over the span of half a century and took home 18 Grammy Awards. In 1987, she became the first woman inducted into the Rock and Roll Hall of Fame. The prolific singer and pianist sang at the dedication of her longtime friend the Rev. Martin Luther King Jr.’s memorial in 2011. She performed at the inaugurations of President Bill Clinton and Jimmy Carter and the funeral for civil rights pioneer Rosa Parks. President George W. Bush awarded her the Presidential Medal of Freedom, the nation’s highest civilian honor, in 2005. One of Franklin’s best-known performances was when she sang “My Country ’tis of Thee” at President Barack Obama’s inauguration in 2009. Music mogul Clive Davis told the crowd “there will never ever be another Aretha Franklin” at the tribute put on by the Recording Academy. Some of the singer’s family members including her grandson who spoke at her funeral were in attendance at the tribute, hosted by filmmaker and actor Tyler Perry. Robinson called Franklin a “game-changing sensation” who had one of the “greatest voices” of all time. Many others echoed Robinson’s sentiments. A video montage of Franklin was shown at the show’s start as quotes paying homage to her were displayed on the screen from Obama, Barbra Streisand, Tony Bennett and Willie Nelson. The video also showed the singer in a joyful moment laughing alongside with King. Throughout the night, renditions of Franklin’s songs from “Respect” to “I Say a Little Prayer” brought people out of their seats. Celine Dion received a standing ovation before she performed Franklin’s version of “A Change is Gonna Come,” which was originally made by Sam Cooke. Patti LaBelle’s voice soared on “Call Me” with a house band led by music director Rickey Minor, as many throughout the crowd yelled out “encore” after she finished. Fantasia, Andra Day, Brandi Carlile and Alessia Cara sang “Natural Woman” together. Common joined Yolanda Adams who sang “(To Be) Young, Gifted and Black” as the rapper inserted his own politically charged rap lyrics into the 1972 song.